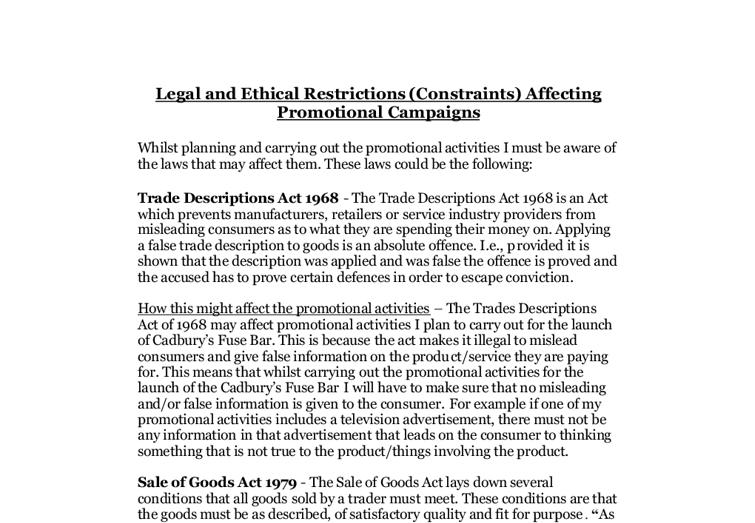 Legal and Ethical Restrictions (Constraints) Affecting Promotional Campaigns Whilst planning and carrying out the promotional activities I must be aware of the laws that may affect them. These laws could be the following: Trade Descriptions Act 1968 - The Trade Descriptions Act 1968 is an Act which prevents manufacturers, retailers or service industry providers from misleading consumers as to what they are spending their money on. Applying a false trade description to goods is an absolute offence. I.e., provided it is shown that the description was applied and was false the offence is proved and the accused has to prove certain defences in order to escape conviction. How this might affect the promotional activities - The Trades Descriptions Act of 1968 may affect promotional activities I plan to carry out for the launch of Cadbury's Fuse Bar. This is because the act makes it illegal to mislead consumers and give false information on the product/service they are paying for. This means that whilst carrying out the promotional activities for the launch of the Cadbury's Fuse Bar I will have to make sure that no misleading and/or false information is given to the consumer. ...read more. This is because the act makes sure that goods are as described. Whilst carrying out the promotional activities for the launch of Cadbury's Fuse Bar I will have to ensure that the product is described accurately. Customer Protection Act 1987 - The Customer Protection Act governs both the pricing of products and product safety. The way in which prices are presented to customers is controlled by a very detailed code of practice. This covers most forms of promotional marketing. There are rules which deal for example with how sale prices can be claimed, introductory offers, recommended prices and free offers. 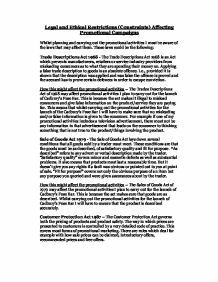 How this might affect the promotional activities - The Customer Protection Act of 1987 may affect the promotional activities I plan to carry out for this promotional campaign. Morality and Ethics of Advertising Businesses must also act morally and ethically when promoting their products and services. This means that businesses should act in an "acceptable" way when promoting products and services. Organisations that monitor business behaviour include: Trading Standards Institute - The Trading Standards Institute, formerly the Institute of Trading Standards Administration (founded in 1956), formerly the Incorporated Society of Inspectors of Weights and Measures (founded in 1881), is the professional association which represents trading standards professionals in the UK and overseas. ...read more. As they can stop harmful, misleading and offensive advertising I must make sure that my promotional activities do not cause offence, give out misleading information and are not harmful to any consumer. For example if a chose to include a swear word in my magazine advertisement for the Cadbury's Fuse Bar, the ASA would most likely not allow the advertisement to continue being published/used. The Independent Television Commission - The Independent Television Commission (ITC) licensed and regulated commercial television services in the United Kingdom (except S4C in Wales) between 1 January 1991 and 28 December 2003. In 1988, the Broadcasting Standards Council was set up to monitor 'taste and decency' on television. In 1990, large-scale changes brought about the Radio Authority, the privatization of the IBA's engineering division as NTL, and formation of the Independent Television Commission. The ITC has ceased to exist from 18 December 2003 and its duties have been assumed by Ofcom, the Office of Communications. Ofcom is the independent regulator and competition authority for the UK communications industries, with responsibilities across television, radio, telecommunications and wireless communications services. How this might affect the promotional activities - ITC/Ofcom may affect the promotional activities I intend to use. Sources: http://www.wikipedia.org, http://www.ofcom.org.uk, http://www.asa.org.uk/asa/, http://www.tsi.org.uk/ ...read more. forms of offline mapping is possible only on integration at the client level. Typically agencies such as these provide end-to-end solutions. However, in some cases the interactions are managed through an advertising agency. It is finally the client's call to decide if only one agency should be involved or multiple ones. The media involved will all be looked at closely and will be reviewed often to see if it is effective. Customer reactions will be noted and our advertisement will change accordingly if it has to. The actual launch period of heavy advertising and promotion and media coverage will be of a 3-month period starting in November. Marketing Mix The marketing mix describes all the activities that go together to make the customer buy a product. The marketing mix shows all the different stages and gimmicks to make a consumer buy a product your marketing mix needs to be within a good range or quality for price, product, promotion and place. These include 'I want to find out more about the news and areas that interest me', 'I want a quick and easy read on the latest news and events', 'I want to relax', 'I want to fill in some time' and 'I want to get information on products or services I am considering buying'. The idea can take the form of an unexpected set of words or a graphic symbol. It also can be a combination of words and graphics, and even music. An advertising idea works best when it is a totally unexpected yet thoroughly relevant fulfilment of the strategy.